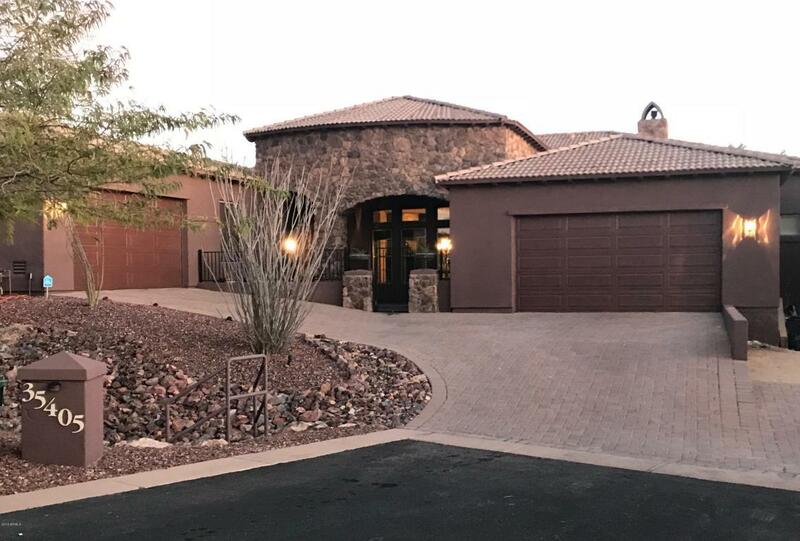 Nestled back in the elevated cul-de-sac of it's own little private drive, and set back against the spectacular sunsets of the Sonoran Desert Mountains. 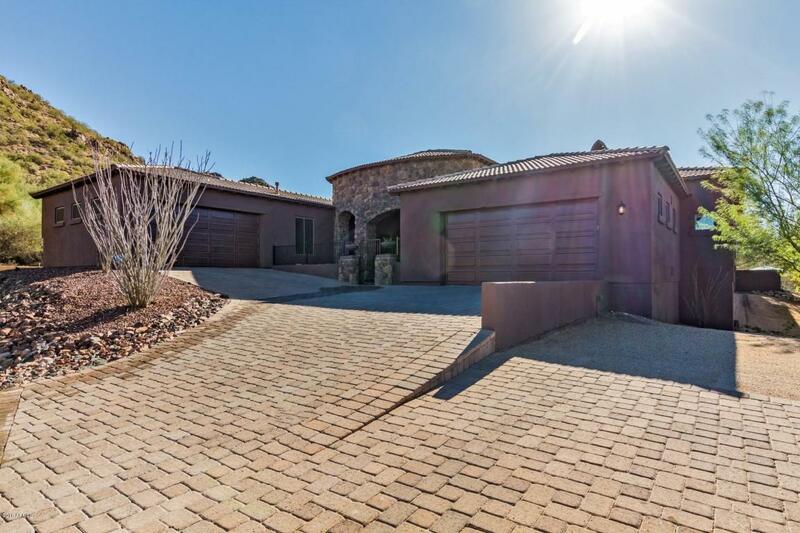 One of the very few 4000+ sq ft luxury homes on more than a half-acre of private and perfectly manicured Sonoran Desert landscape. The meticulously placed paver driveway welcomes you to the stone and arches of the vineyard-inspired courtyard. Open up the 9 ft custom front-door, and the eye immediately begins to explore the expanse and elegance of a truly open floor-plan! Natural light fills the house with so many windows, and the 4 floor-to-ceiling sliders of the great-room open to invite you into the exquisitely serene world of a totally private $100,000+ backyard...please click MORE for the details...On to the backyard now where you'll find a beautiful Sonoran Resort deck/patio (with the 2 steps down), a true professional TEPPENYAKI TABLE (it's true) and built-in grill/bar, a pebble-tech pool with waterfalls and rocks, very nicely fenced, and the crown-jewel: the smooth rock path leading a tour-worthy CACTUS GARDEN around the botanical garden and preserve-like backyard! Take the hidden steps up the mountain 20 ft to the elevated sitting area, to enjoy the view and reflect on life. Back inside now!!!! So this premium professional kitchen is connected to the great-room and it boasts a huge center island/bar (where everyone always gathers), all built-in upgraded Wolf & Subzero stainless appliances (the fridge is so big), 2 dish-washers, 2 ovens, a pot-filler, upgraded granite counters, custom mocha cabinets and with the perfect back-splash. The formal dining room has a wet-bar, glass display cabinets and storage cabinets, counter space, and the best part is a walk-in, rock-walled, and temperature controlled.... WINE CELLAR! Ah the bedrooms...the generously-sized owner's suite features a romantic travertine and marble fireplace, sitting area, an inviting built-in bathtub, and the snail-like gigantic travertine shower for two. His and her closets with custom shelving. All of the rooms feature plantation shutters, walk in closets, nice carpet, large windows, and either a full bath or a few feet from a bull bath. Plenty of room for your "toys" in the 4-car garage! Infared security system and cameras convey, but the monthly security service, control panel, and modem are with Cox at $10/month. NEST thermostat system for heating/cooling, and the Cox Security and cameras are all controlled from a smart-phone app! You won't find anything like this under 900k, anywhere, and you've just got to see it!! !